Religion played a big part in the lives of the Ancient Egyptians. They believed in a wide variety of gods and goddesses. These gods could take different forms, usually as animals. The same animal may represent a different god depending on the area, temple, or timeframe. Ra - Ra was the sun god and the most important god to the Ancient Egyptians. Ra was drawn as a man with a hawk head and a headdress with a sun disk. At one point Ra was combined with another god Amun and the two made an even more powerful god, Amun-Ra. Ra was said to have created all forms of life and was the supreme ruler of the gods. Isis - Isis was the mother goddess. It was thought that she would protect and help people in need. She was drawn as a woman with a headdress in the shape of a throne. Osiris - Osiris was ruler of the underworld and god of the dead. He was the husband of Isis and father of Horus. Osiris was drawn as a mummified man with a feathered headdress. Horus - Horus was the god of the sky. Horus was the son of Isis and Osiris. He was drawn as a man with the head of a hawk. The ruler of the Egyptians, Pharaoh, was thought to be the living version Horus. In this way Pharaoh was the leader of the Egyptian religion and the people's representative to the gods. Thoth - Thoth was the god of knowledge. He blessed the Egyptians with writing, medicine, and mathematics. He was also god of the moon. Thoth is drawn as a man with an Ibis bird head. Sometimes he was represented as a baboon. 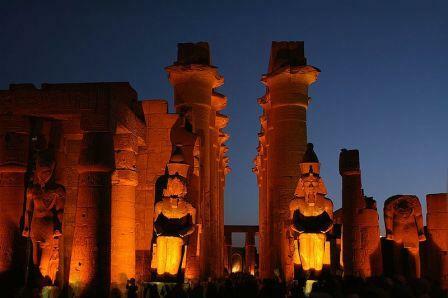 Many Pharaohs built large temples in honor of their gods. These temples would have large statues, gardens, memorials, and a place of worship. Towns would have their own temples as well for their own local gods. Some famous temples include the Luxor Temple, the Temple of Isis at Philae, the Temple of Horus and Edfu, the Temples of Rameses and Nefertiti at Abu Simbel, and the Temple of Amun at Karnak. Was Pharaoh considered a god? The Ancient Egyptians considered Pharaoh to be their main intermediary to the gods; perhaps more of a high priest than a god. He was, however, closely associated with the god Horus and may have, at times, been considered a god in human form. The Egyptians believed that there was a life after death. They thought that people had two important parts: a "ka", or life force that they only had while alive, and a "ba" which was more like a soul. If the "ka" and "ba" could be united in the afterworld the person would live in the afterlife. A key component was that the body be preserved for this to happen. This is why the Egyptians used the embalming process, or mummification, to preserve the dead.